You can tell when you drive into the laneway at Terra Verde farm near Conn in Wellington County that there are a lot of projects on the go here. Young fruit trees populate the front lawn. A perennial bed flanks the lane. Young fry chickens are pecking through the grass and two blond boys are racing into the garden while a young woman comes forward to greet me with dirt-stained hands. This is Lorraine Blackwell and she manages the 1.5 acre Community Supported Agriculture (CSA) garden, which is an innovative system of local food production in which the consumer pledges to support the grower by purchasing food shares. Fifty customers have paid between $450 and $500 in a close relationship where the growers and consumer share the risks and benefits of food production. Over 500 vegetable varieties are grown at Terra Verde and that’s just one of the ongoing projects that keep Lorraine and her husband Rob Johnson very, very busy. I’ve actually come here today to talk about trees. That’s Rob’s specialty. And we do chat about trees but so many other subjects sprouted during the interview I realized this is more a story about ideas taking root. It stems from Rob’s belief that the future of the planet, and our ability to feed people, revolves around sustainable farming. “There is a correction coming,” he predicts. Desertification, salination, droughts, forest depletion, carbon loss and climate change are all issues he worries about. As fears about food supply grow, Rob and Lorraine decided to be proactive and purchased a 10-acre farm with the intent to be ecologically self-sufficient and in the process, learn strategies to teach others to do the same. In his readings and research, one article that stuck with him was from Oxford University which suggested that the best way to counteract climate change is to plant trees. This resonated with Rob, whose career has focused on environmental restoration and tree planting. He currently works for the County of Wellington managing the Green Legacy program which has seen over 160,000 trees planted, and continue to be planted with the aid of community partners and school programs where students start trees from seed (Kindergarten to Grade 3), nurse them (Grade 4-6) and plant them (Grades 7-8) as part of their learning experience. 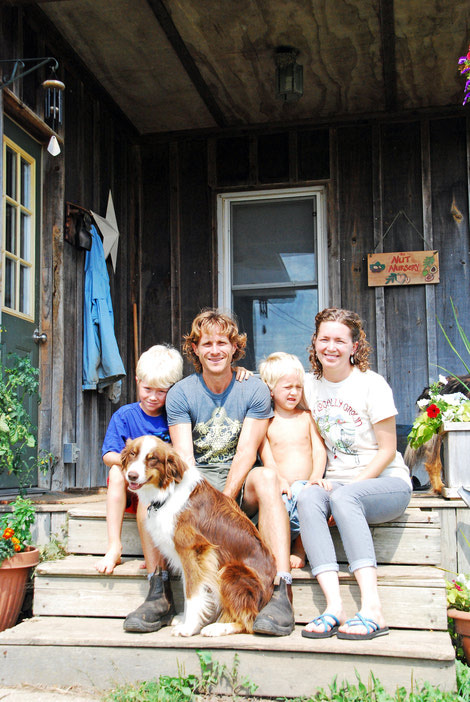 His farm is becoming a model of permaculture and an ecosystem approach to farming. Now four years in, Rob and Lorraine are starting to see progress and an income, although Rob’s hope to farm full-time has been pushed back to 2020. Profits, like trees, grow slowly. But the ideals continue to flourish as Rob, used to pushing his body in ultra-marathon races, works 16 hour days to make practical the ideas that fill his head. Trees are a good starting point since Rob believes they have the greatest potential to make change. At Terra Verde, tree planting follows a silvopasturing model which integrates pasture and animals. 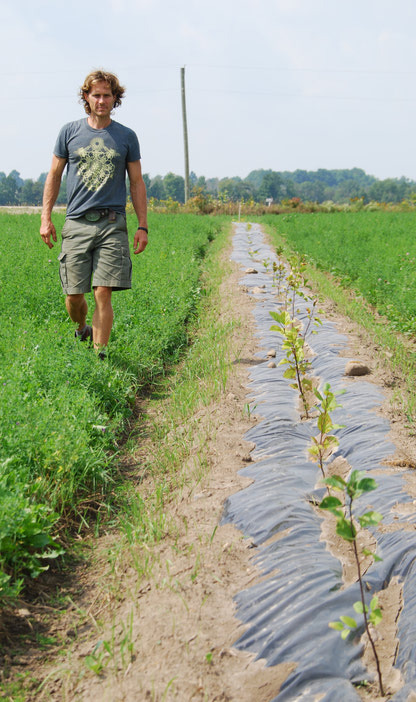 Instead, of planting a monoculture orchard, he plants varieties of trees in rows through his crop fields and pastures. Integrating fruit and nut trees, along with bee-loving trees like honey locust naturally prevent disease. The intent is that as the trees grow, they will create microclimates to grow better crops. When they begin producing, the fruit and nuts will feed both people and animals. The shade provided will reduce heat stress on the animals grazing on the grass strips in between, as part of a mob grazing system where animals rotate quickly through pasture paddocks allowing the grasses to regenerate from 45 day rest periods. Rob also refers to the process as a savannah system of scattered trees, animals and crops creating a productive ecosystem. Rob grows the trees from seed. Many of them start in his fridge, in a process called stratification where the seeds are kept cool and moist to mimic winter conditions. Other seeds, like those of the Honey Locust and Kentucky Coffee Tree require scarification which Rob does by popping them into a blender to lightly nick the seed. He starts from seed to reduce costs and to develop a small tree nursery. Many of the trees he will plant, some he sells as an income supplement on the farm. Seedlings currently potted include apple varieties such as Wealthy, Liberty, Bellmac, Novamac, Red Free and Idared. There are Asian pear, plus peach and plum varieties. Nut varieties include hazelnuts, chestnuts, heartnuts, buartnuts (butternut X heartnut), hickory, black walnut, northern pecan and Korean pine (which produce pinenuts). Elderberries and spruce trees have been planted around the nursery to create a microclimate for the seedlings. The elderberries were specifically chosen because they can grow bushy and can handle extra moisture from the water sprinkling system. Plus, they provide flowers for tea and berries for wine. You’ll find a few Black Locusts for the beehives flanking the animal shed. Bees are everywhere and the roving chickens find them fascinating. Every once in a while, Rob will hear a chicken squawking and running pell-mell across the pasture after trying to feed on the bees. Generally, though, it’s a peaceable yard as the ducks, chickens, turkeys, guinea fowl, llama, sheep and goats share quarters. Like the animals, the mixed trees support each other. 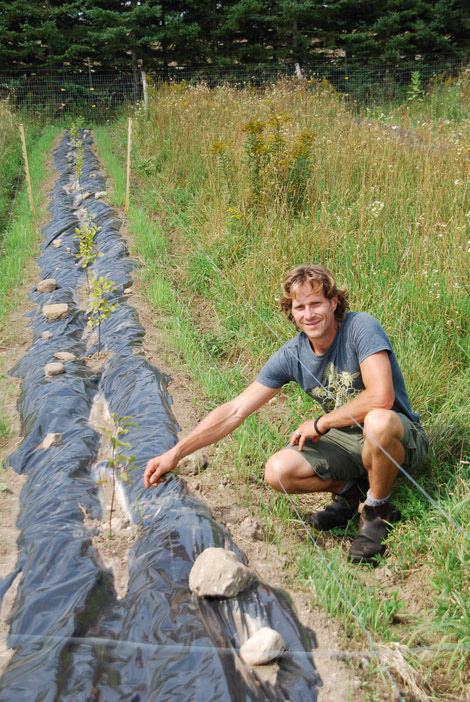 Locust trees are good nitrogen fixers, explains Rob. Their trunks also serve as supports for the grape, kiwi and Schisandra (a superberry) vines he plans to grow up them. Four years in, with more ideas than time, projects are in various stages of completion. “I’m doing a gazillion things and finding it hard to find time to finish anything,” admits Rob. He needs more time, more acreage, more help and more time-saving systems that will make his ideals palatable to more conventional farmers. Plastic was one of them. The first trees he planted were mulched to retain moisture and suppress weeds. However, Terra Verde soils are rife with twitch grass and other competitive weeds. Since Rob and Lorraine are organic farmers, they cannot spray. Instead, they decided to use plastic. So now he uses his BCS tractor with accompanying attachments to create raised beds in the fields. He creates a ditch down the middle, then covers the bed with 10 millimeter thick plastic. 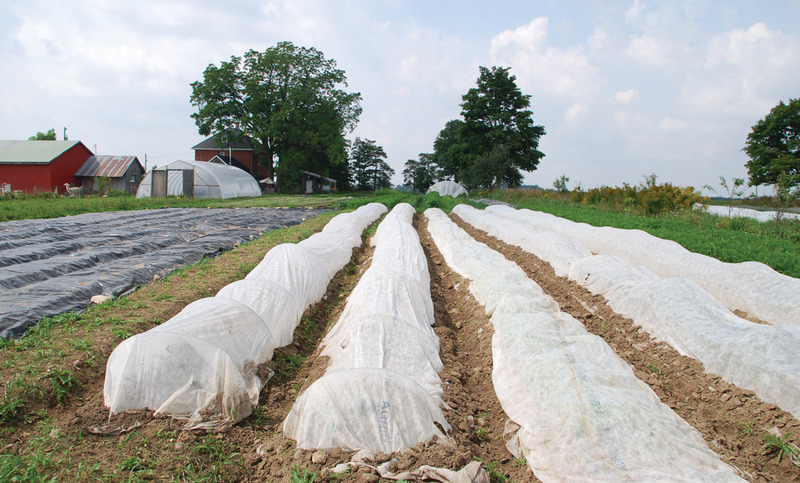 Trees are planted into the bed and the plastic pushed down into the ditch, creating a causeway where rains can collect, to naturally water the young trees. Another problem he had was animal pressure on the trees. The animal population is small but growing at Terra Verde. The idea is to raise poultry, sheep, goats, pigs and llamas on the grass stretches between the tree planting. When he first let sheep into the treed paddocks, he discovered they would use their body mass to push against the protective cages he had placed around the trees so they could nibble at the bark. “I had to move to hot wire which works very well,” says Rob. 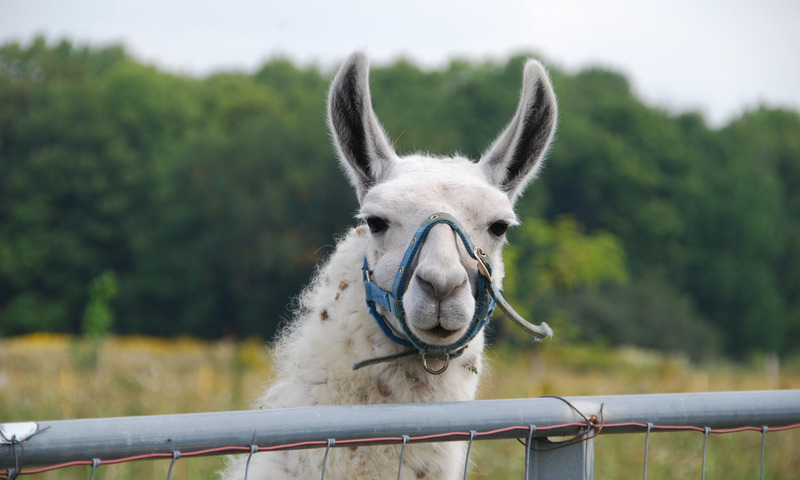 The llama serves as a protective animal and two Kunekune pigs are due to arrive shortly. They are a small, friendly, foraging pig which can live on grass and hay alone, making them ideal additions to the silvopasture. The Kunekunes aren’t common in Canada so they will be used as breeding stock. The plan is to eat some of their livestock as part of the self sustaining model. Ron and Lorraine have two boys, aged seven and nine, who scamper about the place like puppies, full of adventurous play.